Yay Day 10! So far I’ve managed to keep on top of it, woop woop. This is China Glaze Starboard, with Revlon Copper Penny. I went for the green because it was on my desk staring me in the face, and I always seem to wear blues (when I’m not rocking the nudes). When I do blue gradients, I tend to have gold or silver tips, and my poor little bottle of Copper Penny was all, “Pick me! Pick me!” at me. So I caved. 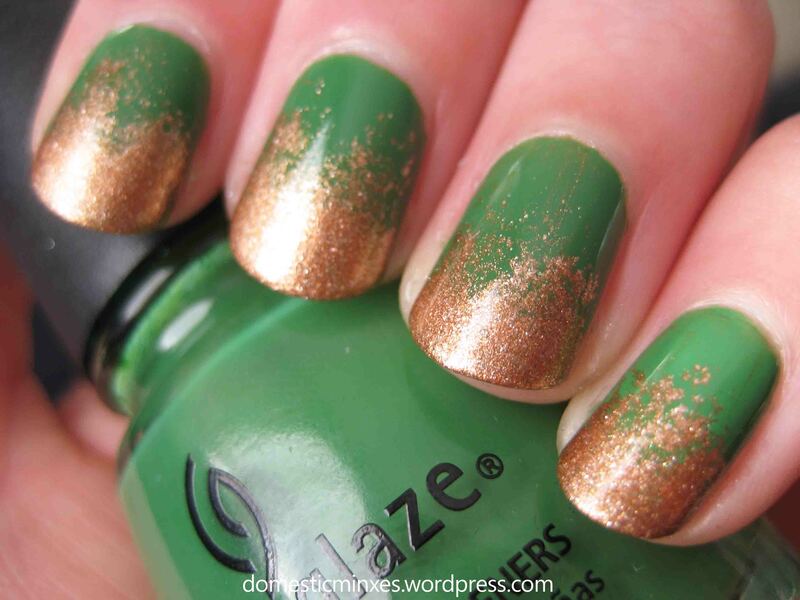 I actually really love this combo, and hey, copper coins go green over time right?! So it was totally inspired and planned out. Not randomly decided by what was on my desk. No no, that’s crazy talk! love it! Spontaneous combos are the best. Ahem, I mean, completely planned ones are *wink* 😀 Love that green!